Hello everyone, CEO Olivia here. It’s the holiday season & that means it’s the time of gift giving. I know you humans are scurrying about like squirrels buying gifts for your loved ones but I would like you to add one more item to your list. Have you ever considered donating to an animal shelter or rescue group at this time of year? It’s a wooftasticly kind thing to do. I did some sniffing about & found what they need most often. Blankets & towels – shelters go through a lot of them. Not so much comforters because the stuffing could become an issue if a dog shredded & ate some. Food – shelters go through a lot of food. Not just dog & cat food. Consider bird or rodent food for rabbits, hamsters, rats & their kin. Toys – There is a lot of down time at a shelter. A toy can turn a boring day into play time for a good dog or cool cat. Money – the daily operations at a shelter can be costly. A cash donation of any size can be of help. Time – volunteers are always needed & welcome. Dogs need to be walked & cats need play time. Both need to be regularly socialized to optimize their chances for adoption. Who knows, you might make a new best furriend. Cat Litter – A shelter can go through a lot of litter quickly. Consider also groups like the Freedom Drivers. They transport animals out of high kill shelters to new homes, fosters or no kill shelters. Sometimes this requires several drivers covering great distances. They can always use your help either financially or you could volunteer as a driver. I know you get a good feeling inside knowing you’ve helped a good dog or cat have a better life. Kindness & compassion are the best gifts of all. 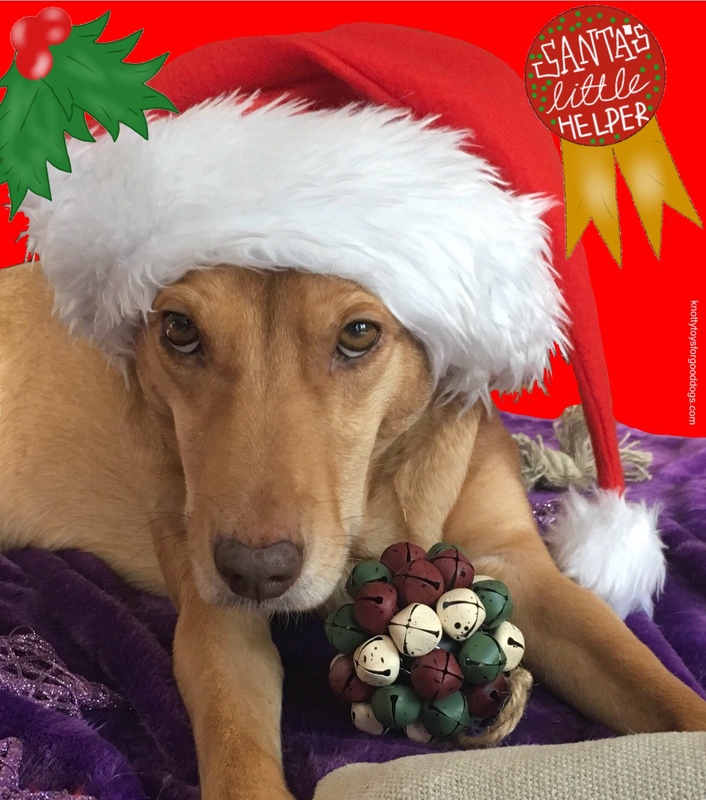 All of us here at Knotty Toys for Good Dogs wish you & your loved ones a very happy & safe holiday season. Pawfect suggestions for this time of year. All best wishes for Fleas Navidog. We give to the Morris Animal Foundation’s Golden Retriever Lifetime Study every year in memory of our sweet Callie – who we lost to lymphoma three summers ago – and in honor of our sweet Shadow who is still with us. During the year I usually donate old toys and other things to the shelter from which we adopted Ducky.